PMO stands for Project Management Office, while a PMO dashboard contains the summary of all the projects being run by an organization. It is a helpful tool for the project managers and the senior personnel of the business who want to keep themselves updated with the status of any project handled by their team. A PMO Dashboard is basically required in organizations which handle multiple projects. It helps in understanding the type and the status of any work with a quick glance, thus, saving a lot of time of the senior management without the need of getting deeper in the work process. However, if needed, they can coordinate with the project handler and get going with the process. Why do we need a PMO Dashboard? Predict whether the project will be a success or a failure based on the time taken to complete the mini goals. 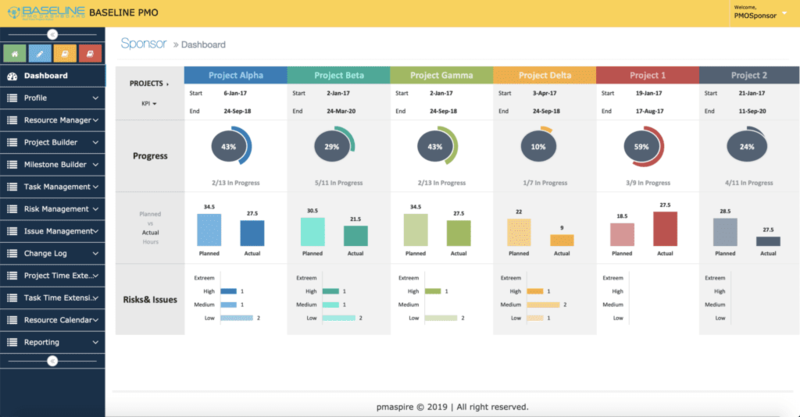 Here is the Ultimate Solution: PMaspire “Baseline” an AI Based PMO dashboard with cloud Project Management Tool to help project sponsor, project managers manage project online with transparency and clear visibility. As a PM or Sponsor, you can ensure your maximum output of resources to for meeting the Deliverables in the Most Efficient way. Yes, you can really manage all with just one tool meet to your project goal!